Previous A Midwinter’s Spring Cleaning Next It’s a Beautiful, Beautiful, Beautiful Day! You’ve tapped into the secret of happiness here! Forgetting the past, with its lingering regrets, and foregoing looking to the future, often with worry, we live in the moment! Isn’t this all we truly have? I believe that God loves the ordinary, and that He can turn any moment into extraordinary if/when we allow Him into that moment. ” enthousiasmos” is the Greek root for “enthusiasm”, and the original term meant God within. If we want to live life with more enthusiasm, we can let God into each moment, each day. The result can be astonishing! Thanks for sharing your song/poem. I’ve got a 12 bar blues going with it, but i’m sure it’s a matter of choice for each of us how it sounds. The message is key! Remain inspired, count your blessings and be a blessing! 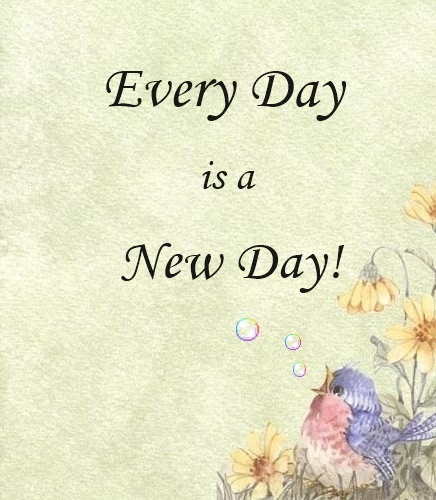 Marianne – – Thank you for sharing your poem/song “Every Day is a New Day.” It is very true and certainly motivational. Do you play any instruments? If you play a piano or guitar something that you can easily make it a song. Other instruments like trumpets, saxs, violins, etc. are very difficult to connect the words with a nice background. Thanks for sharing! Tom, thank you for your kind comment. I used to play piano a little bit, but haven’t played in over 40 years. It’s funny because I don’t really like musicals, but the tune this poem/song came out with sounds just like a musical…hahaha. But it’s cheerful and I like to sing it to give my soul a lift. I’m glad you enjoyed it.